Whistling Hitler Tea Kettle & All the News That Isn’t | Whad'ya Know? Too bad about the Supreme Court decision–I was hoping to patent my genes for Father’s Day. The good news is that not a single Supreme Court justice will be able to patent his or her genes. Leaker Edward Snowden appears on the Chinese 10,000 Yuan note. The NSA is rethinking its strategy of hiring security contractors from guys standing around the Home Depot lot. Turkey illustrates why fewer and fewer countries are now building squares. Challenged on their stop and frisk policy, New York City police will now frisk on the go. The guy eating ice cream out of the machine and the guy licking the tacos are not the same guy. Good news is they will not be able to patent their genes. The Wisconsin assembly passes a bill allowing your to stick donations right in your representatives g-string. After an ultrasound. The immigration bill is hung up on migrating birds. 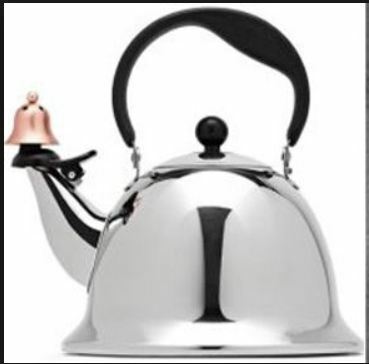 Penny’s whistling Hitler tea kettle re-design looks very much like Stalin. The Census Bureau says Asians are the new Hispanics. Tomato sauce good for the prostate but hard to slather on. Turns out a chemical in food packaging is what makes you fat, so you may as well throw away the contents. Study finds hands-free head banging still a driving distraction. US tells leaker Edward Snowden he may be a Publishers Clearing House Winner, but must accept the giant plywood check in person. The Putins divorce–Lyudmila gets everything east of Vladivostok. Turns out to be the Sea of Japan. Big opportunities in divorce law in Russia. And, Rupert and Wendi Murdoch divorce, because frankly, she’s not getting any younger . . .
That’s All the News That Isn’t . . . . This entry was posted on June 17, 2013 at 10:08 am and is filed under Uncategorized. You can subscribe via RSS 2.0 feed to this post's comments.